No one likes their feet to freeze in the winter. That’s why shearling boots in Steamboat Springs, CO are a popular choice. Shearling itself is skin that is derived from a sheared lamb or sheep which has been tanned with the animal’s wool. One side exhibits a suede surface while the other side displays a surface of clipped fur. Shearling can either be manufactured with actual sheepskin or from imitative fibers. Actual shearling is more breathable than its synthetic counterpart. One of the brand shearling boots in Steamboat Springs is the Ugg brand of boots. Found at the Steamboat Shoe Market, Ugg offers the highest quality in shearling boots of this type. For example, Ugg’s Jocelin boots are definitely a sartorial statement in fashionable boot wear. Pair the woman’s boot with romantic floral prints as well as leggings or skinny jeans. 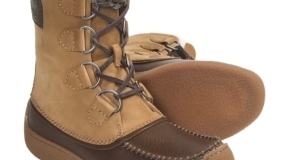 The boot is designed to epitomize a rugged kind of chic that is ultimately warm and comfortable to wear. The ankle boot, which displays a sheepskin collar, adjustable strap and Nubuck upper, features a sheepskin-lined insole as well. There is nothing synthetic about the wool used this premium product. So if you are looking for quality shearling boots, you can stop your search by visiting the Steamboat Shoe Market. Not only does the retailer feature the Ugg brand, it also showcases boots by Sorel, The North Face, Bogs and Rieker. Contact Steamboat Shoe Market at 970-871-8566 if you need further information about their boots and shoes.